Welcome to District 12: #TickTock12 REVEALED! The clock has struck! 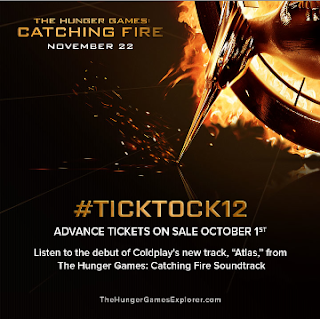 #TickTock12 has brought the announcement of Catching Fire ticket sales on 10/1 and the debut of Coldplay's Atlas. #TickTock12 - To kick off our 12 Week #TickTock Countdown until The Hunger Games: Catching Fire hits theaters, Lionsgate has announced that movie tickets will be on sale beginning OCTOBER 1st at 9am PT/12pm ET! Listen to the world debut of Coldplay's new track “ATLAS” today, from The Hunger Games: Catching Fire Soundtrack, then share the link for a chance to win the original lyric sheet handwritten by Chris Martin & an exclusive #TickTock12 badge! Check out the site to enter! To celebrate the release of THE HUNGER GAMES: CATCHING FIRE, Lionsgate has begun their twelve week "TickTock" countdown! Each week, more surprises will be revealed through The Hunger Games Explorer to get you excited for the most anticipated film of the year. To kickoff the countdown, Lionsgate has revealed #TickTock12 with the announcement that movie tickets will go on sale starting October 1st! Advance movie tickets will be available through Fandango and MovieTickets.com on Tuesday, October 1 at 12pm ET / 9AM PT. To continue the celebration, the first track off THE HUNGER GAMES: CATCHING FIRE Soundtrack, 'Atlas' by Coldplay, is available NOW! Give it a listen, and make sure to head over to The Hunger Games Explorer this week to have the chance to enter Lionsgate's 'Listen & Share' contest. It’s where you will have the chance to WIN the original lyric sheet, handwritten by none other than Coldplay's Chris Martin! Participate online with the hashtag #TickTock12 this week and stay tuned to The Hunger Games Explorer for more information!